Toast of the Town 2005, held in late May, managed to be both bigger and better than ever: There were more wineries pouring their finest, more New York restaurants offering food of sublime flavor and creativity, and more attendees, Manhattanites in search of gourmet fare and good times. Lincoln Center’s New York State Theater promenade, in all its grandeur, once again was the setting for the walkaround wine-and-food tasting event. Stellar wines were to be found at every table, but some standouts included Charles Krug 2002 Vintage Selection Cabernet Sauvignon, J. Garcia 2001 Cabernet Sauvignon, Anton Bauer’s 2002 Reserve Grüner Veltliner, Laroche 2002 Chablis Saint Martin and a Cheval Blanc from Moët Hennessy. Food highlights included Chef Scott Ubert’s offering from Ono, Sweet Sake Foie Gras Parfait with Ginger Plum Chutney; Rosa Mexicano’s classic guacamole; Asia de Cuba’s Tuna Tartare; and Balducci’s Pancetta-Wrapped Long Island Duckling served with a Black Bean and Goat Cheese Taco. The list could go on and on, because the restaurants went all out to ensure that the food was consistently outstanding. The next Toast of the Town event will be held in May 2006. 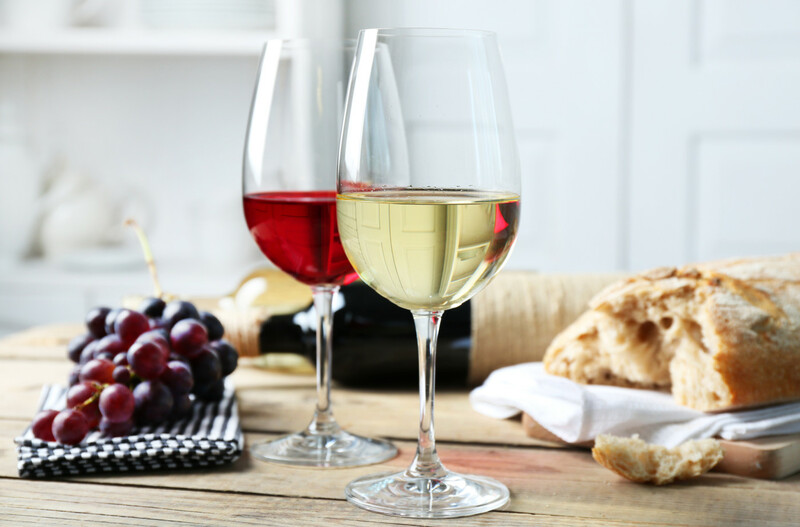 The U.S. Supreme Court’s May 16 ruling, that states are prohibited from making it illegal for consumers to buy wine directly from wineries located outside their home states, has been hailed as a major victory for the wine industry. But it will be years of hard slogging before most Americans are able to order wine from anywhere they want. Until now, free commerce between wineries and consumers has been permitted only in about half the states, under a hodgepodge of laws. The other states have prohibited their residents from having wine sent to them by wineries, except those in the same state. In the Supreme Court case, the wine industry and associated consumer groups sued two states, Michigan and New York, which had such restrictive laws. The Court’s 5-4 majority decision, written by Justice Anthony M. Kennedy, found that "Both states’ [Michigan and New York] laws discriminate against interstate commerce in violation of the Commerce Clause [of the Constitution], and that discrimination is neither authorized nor permitted by the Twenty-first Amendment." In a dissenting opinion, Justice Clarence Thomas argued that prior laws that prohibit the interstate shipping of alcoholic beverages remain constitutional because they "do not run afoul of the negative Commerce Clause." California wineries celebrated the decision. "It’s been a long eight years trying to get the Supreme Court’s attention," declared Paul Kronenberg, president of Family Winemakers of California. "In this David versus Goliath battle, the ruling is a triumph for America’s family wine farmers," said W. Reed Foster, president of the Coalition for Free Trade, the industry group that led the legal battle. Despite the victory, "The grapes are not immediately free," warned Jeremy Benson, executive director of Free the Grapes!, a consumer group that worked with the Coalition for Free Trade. That’s because each state now has a choice: whether to fully comply with the high court’s decision, or to prohibit direct shipments of wine from all sources, including in-state wineries. Such a step would be consistent with the Court’s ruling; Michigan already has indicated it will go that route. Thus, the battle is far from over. Ken Starr, who led the impeachment proceedings against former President Bill Clinton and was lead counsel for the Coalition for Free Trade, optimistically said, "My crystal ball is as cloudy as anyone’s, but I’ll predict all 50 states…will in fact move to some form of non-discrimination system within 10 years." Coming to a fancy food shop near you, just in time for summer: LaLoo’s Goat Milk Ice Cream. Designed by Laura Howard, this new Sonoma County product is healthful, very low in fat and just plain delicious. It’s offered in a variety of flavors, including Black Mission Fig, Chocolate Cabernet, and Scharffenberger Chocolate. How did Howard come up with the idea? A combination of believing in the beneficial qualities of goat’s milk, and disapproving of the fat content of most ice cream. LaLoo’s can also be digested by most people who are lactose intolerant, due to goat milk’s low lactose content. Available in pints at Dean & Deluca, Whole Foods and other fine stores. See www.goatmilkicream.com for more details. Change is good. Plagued by dwindling receipts the last 3 years, the Napa Valley Vintners decided to alter the for mat of their annual charity auction. The hope was to return to the good old days, when every year brought new record high bids. Apparently, they were successful. This year’s 25th annual auction brought in more than $10.5 million—essentially doubling last year’s total of $5.3 million—and set new milestones in both the live and barrel actions. Past complaints about too many auction lots, which led to an excruciating 7-hour-long bidding event, and the presence of too many non-bidding attendees, were among the challenges the vintners were obliged to address. In addition, local residents had long complained that they were unable to participate at all because of the high entrance fee. In a bold move, the vintners simultaneously lowered and raised the price of admission while slashing the number of live auction lots from some 150 to a more manageable 56. For the first time, local Napa residents were able to attend the day-long barrel auction on Friday for $75, and out-of-towners could purchase a ticket for $150. During previous auctions, only those who purchased a full 3-day auction pass for $2,500 per couple were able to attend. The new ticket price led to a barrel auction bumper crop of some 3,000 attendees who were able to sample a dazzling array of young wines directly from barrels while eating delicacies prepared by 64 top-notch restaurants, including the renowned French Laundry. In addition, 134 wineries poured a collection of bottled Napa Valley wines throughout the day. This year, those who wished to attend the full 4-day event, which included intimate meals and gatherings at wineries such as Araujo, Kuleto and the new cult wonder, Hundred Acre, had to plunk down $7,500 per couple. As a result, the live auction at Meadowood Resort on Saturday night seemed sparsely attended at first, with only 1,000 bidders and guests—down from the usual 2,000. But the financial means of the attendees was clearly up-and-up. Maybe it was the presence of Tonight Show host Jay Leno that set the tone for the evening. Scheduled to simply introduce the festivities, Leno instead launched into a 40-minute comedy routine that served as a catalyst for bidding. At the end of Leno’s skit, Robert Mondavi approached the stage wearing his trademark gaucho hat and his famous jacket made entirely from wine corks. "We’re gonna auction this guy off," Leno told the crowd. Then he looked at Mondavi. "A beautiful cork jacket. What’s it worth?" "Plenty," the Napa Valley patriarch replied. Vintner Koerner Rombauer won the jacket with a $95,000 bid. Leno then stayed on the stage with auctioneers Ursula Hermacinski and Fritz Hatton for another 11Â¼2 hours, serving up a brilliant blend of wit and irreverence. At one point Leno even created his own auction lot, offering four VIP tickets to the Tonight Show. The bids quickly went from $1,000 to $60,000, with Tatiana Copeland, co-owner of Bouchaine Winery winning. "I always wanted to go on the Tonight Show," Copeland said. "But I didn’t know it would cost so much!" Other television personalities worked the crowd as well. Teri Hatcher, star of Desperate Housewives, came to the stage to promote a Frank Family Vineyards lot that included a trip to Hollywood and a walk-on appearance on her show. As the shapely star came to the stage, Leno said to the audience, "Hefner offered her $2 million. The least you can do is come up with $200,000." "There’s a lot that I’ll do for more money," Hatcher responded coyly, following up with several suggestive poses. The lot went for $300,000 and was nearly doubled when Tatiana Copeland offered another $280,000 for a duplicate lot. The spirit of giving was contagious. Other top lots included $400,000 for a dinner for 20 at Quintessa winery prepared by French Laundry/Per Se chef/owner Thomas Keller. It went to Fred Carl, the C.E.O. of Viking Range. A final offering of 625 bottles from Cakebread, Chateau Montelena, Joseph Phelps, Schramsberg and Silver Oak fetched $550,000 and was won by Joy Craft, of Woodside, California, whose family runs a charitable foundation in South Carolina. Craft, who was attending the auction for the first time, also spent $401,000 on a winemaking collaboration, lunch and dinner with Robert and Peter Mondavi. "I’m so lucky. It will be an opportunity to spend time with two brothers who have made a big difference in the wine industry," Craft said. "Nothing is more important to me than family." Another top item was the lot of 26 lavish gift bags donated by Wine Enthusiast, who teamed up with the Napa Valley Vintners to create Oscar-themed bags worthy of $3,500 bids each. Wine Enthusiast donated portable wine cellars and other luxury goodies. Napa Valley Vintners donated four bottles of wine to each bag. Altogether, 26 bags were purchased, pulling in a whopping $91,000, one of the top lots at the auction. Perhaps the most exciting bidding moment occurred when Austin-based investor John Gorman paid $650,000—the largest sum ever for a Napa Valley auction lot—for four double-magnums of Colgin Cellars 2001. Texas-born vintner Ann Colgin appeared stunned. "I could have had a heart attack," she said, breathlessly. "John is the most generous person I know. It goes back to our Texas roots." "Any woman from Waco, Texas who can make wine like that deserves a bid like mine," Gorman explained. "We are lucky to know her and call her our friend." After the live auction, guests emerged to enjoy dinner in one of twelve different tents hosted by various wineries and restaurants. Each tent offered a theme. One was set up like an Italian marketplace. Another echoed a Moroccan bazaar. Still another conjured up a speakeasy environment, complete with a period jazz band. A large, al fresco dance floor provided the enthusiastic crowd with a post-prandial environment suitable for working off dinner under the Napa Valley stars. The proceeds from the Napa Valley Auction benefit health, housing and youth programs. This year’s results will bring the 25-year total for donation to nearly $63 million. For more information about next year’s auction, contact the Napa Valley Vintners at www.napavintners.com. In this first book-length biography of American wine critic Robert M. Parker, Jr. (Harper Collins, $26), Elin McCoy offers an entertaining look at the man and his work. She also provides a fascinating look at the environment that contributed to Parker’s rise, culminating in his correct call on the greatness of the 1982 Bordeaux, in opposition to many other critics. Parker built on that success by writing for a number of publications—including Wine Enthusiast—in addition to publishing his bimonthly newsletter, The Wine Advocate. Despite working with Parker for several years, McCoy, who was his first editor at Food & Wine (both are now contributing editors), depends largely on others’ observations to paint a picture of him. The exceptions—when McCoy lets us see him through her own eyes—provide the most vibrant prose, as in her vivid description of their first meeting and her later recounting of a day in May 2002 spent traveling with him in California. In that section, the reader is in the room with Parker during several winery visits, getting a largely unfiltered view of him at work. He calls Staglin "a work in progress," trades friendly barbs with Julie Garvey of Flora Springs, soaks in the winemaking patter of James Hall (of Patz & Hall), gets "semi-annoyed" when Ray Signorello asks why his family’s wines have been ignored recently, and swoons over four vintages of Shafer Hillside Select. Unfortunately, McCoy was only able to spend that day with Parker and had only one or two other opportunities to meet with him personally while researching the book. She also conducted several phone interviews. Despite more than 30 hours of taped conversation with Parker, the result is that much of the book relies on third-party observation and anecdotes. In fact, Parker asserts on his Web site that "several stories in the book are completely false." In McCoy’s defense, she does mention when Parker’s versions of events conflict with her sources’ retellings. These discrepancies matter little to the reader’s enjoyment of the book. Most of the tales in the book are undisputed. The details of Parker’s formative years have been previously published in William Langewiesche’s December 2000 Atlantic Monthly article, but McCoy’s recounting of them still feels fresh. Who won’t be charmed by the story of a gawky, soda-drinking college kid in love traveling to France to visit his girlfriend and discovering an incredible world of food and wine? And who cannot identify with the drudgery of Parker’s job as a bank attorney in contrast to his driven passion for his hobby? In the end, as McCoy told me by telephone, it is a story about the American dream—about a man who follows his dream and succeeds. We can all relate to that, even if we can’t all achieve it. Twenty years ago, Harold McGee’s On Food and Cooking changed our understanding of the culinary alchemy. For example, pre-McGee, we thought that searing meat sealed in the juices. Not true, he explained. Searing is a good idea, but for a different reason—the "browning reactions" on the meat’s surface enhance the flavor. With a completely revised edition of his classic just out, McGee shared his views on cooking with wine. Wine Enthusiast: What does wine do for food? Harold McGee: Several things. It contributes distinctive flavors reflecting the qualities of the grapes that went into the wine and the way it was fermented. Acidity helps create a flavor balance. When you cook wine down, the acidity isn’t volatile—that is, the molecules don’t escape—so the wine gets tarter and tarter, providing wonderful backbone. Wine also supplies alcohol, an advantage in some respects, but when heated, alcohol can have a harsh quality. That’s why we often boil or flame off the alcohol, to take off that edge. WE: Would your dish be better if you cooked out all the alcohol? HM: No, in trace amounts alcohol contributes to the volatility of aromas, helping them escape the food and reach the olfactory receptors in our noses. Too much alcohol, on the other hand, can trap some of those aroma-producing molecules. Some cooks, such as Chef Thomas Keller, minimize the alcohol by simmering it separately before adding to a dish. It’s impossible to remove all the alcohol, though, because the molecule has an affinity to water—as long as some liquid is left in the pan, there’s also some alcohol. WE: We’ve all made a pan sauce by deglazing with wine after cooking meat or chicken. Any tips on that? HM: Be careful about the tannins in red wine, which contribute to a sensation of astringency and, to some extent, bitterness. Remember, those molecules aren’t volatile, so when you reduce the wine, they get more concentrated. One solution is to choose a wine that is not especially tannic, such as a Merlot or Pinot Noir, or [one that] has aged enough to soften the tannins. If you’re cooking with a wine that is tannic or likely to become so, counteract the effect by adding an ingredient with protein, such as chicken stock. That way, the tannins bind to the proteins in the stock rather than the ones on your tongue. WE: How good does the wine need to be for cooking? HM: It depends on the dish. If the wine is cooked very gently or is uncooked, it pays to use really nice wine. When you’re cooking, using an especially fine wine doesn’t make sense because its special qualities—especially the aromatic properties—are going to be transformed. The important thing is to begin with a well-balanced wine because the acidity and astringency are only going to be intensified. WE: If a recipe calls for a fine wine like Barolo or Bordeaux, should you assume there’s a good reason? HM: Not necessarily. A lot of recipes containing wine originally came from wine-producing regions. The wine specified happened to be what they had on hand. WE: Some recipes for beef bourgignon call for nearly a whole bottle of Burgundy. Would a cup or two accomplish the same thing? HM: I don’t think so. In a dish like this, evaporation is limited, so you’re not concentrating the nonvolatile qualities—the acidity in particular. You might need that much to submerge the meat and expose it to the right level of acidity. WE: Would you be on safe ground cooking with the same wine you’d drink with a particular dish? For years, home chefs have relied on steel vegetable peelers. But no more. The latest thing is the Mega Peeler from Kyocera, whose blade is fabricated of space-age ceramic. It won’t rust if you forget to dry it right away, and it’s dishwasher safe. The company claims that it’s sharper than traditional peelers and holds its edge up to 10 times longer. Skeptical, we tried one at the office. Not only does it peel with aplomb, you can also use it to make parmesan or chocolate curls. We liked the company’s Ceramic Slicer even better, which effortlessly churned out perfect slices approximately 1/10-inch thick—the ultimate incentive for making your own potato chips. The 2005 Passport to Cabernet, held by the California Cabernet Society in May, is the trade’s first opportunity to taste the latest Cabernet Sauvignons and blends from barrel. From my tastings at this year’s Passport, which was held at the Culinary Institute of America, 2004 seems to be a good, but not great, vintage for Cabernet. September heat waves caused problems of soaring sugar levels and a crush rush, resulting in lack of pickers and/or fermenting tanks. Many wines were unbalanced, with thin midpalates and short finishes, or were overly tannic. We all know that wine is good for the heart. Now, thanks to a first-of-its-kind $7.6 million grant from the National Institutes of Health, we might learn why. François Booyse, professor of medicine and director of molecular cardiology at the University of Alabama- Brimingham, landed the grant last fall. Today he’s peering at diseased mouse arteries to see what happens to blood clots and artery-clogging plaque when the rodents are given alcohol and polyphenols (a scientist’s version of wine), and, most important, which one is responsible for the heart benefits. His hypothesis? "I think there’s an additive effect between the two." Stay tuned. Picture it: A street crammed with people drinking wine and laughing as a procession led by a brass band leads members in ancient Grecian garb down the street, tossing beads as they go. This was just day one of the 2005 New Orleans Wine and Food Experience (NOWFE). The Royal Street Stroll is one of the major highlights every year, as the many area art galleries and antique shops pour wine and serve food. The pandemonium is sponsored by the 406-member Krewe of Cork. In addition to the stroll, NOWFE offers numerous seminars, on topics ranging from pairing tomatoes with wine to a blind tasting challenge, as well as two days of Grand Tastings—approximately 3,500 people gathered each day to taste wine from 150+ wineries and food from over 40 restaurants. The event concluded with Bubbles and Brunch, a buffet at the fabulous Omni Royal Orleans Hotel. With everyone having such an amazing time, from the ticket holders to the vendors to the staff, who was the biggest winner of the night? My vote is Stacey Parkman, a New Orleans resident, winner of the big raffle of Saturday night, who walked away with one of every bottle being poured at the Grand Tasting—for a total of 740 bottles.